An integral part of early intervention services includes monitoring the growth in skill development for young children with hearing loss. If a child was identified at birth and received amplification/intervention within a couple of months, then the goal is one month of development per one month of age. If the hearing loss was identified and amplification/intervention not provided until 3 months or later, then the goal is more than one month per one month of age. If a child with a delay only gains 6 months of development in 6 months time then he or she will never catch up to age peers by school entry. The following are resources that can be used by interventionists/parents to track skill growth over time. 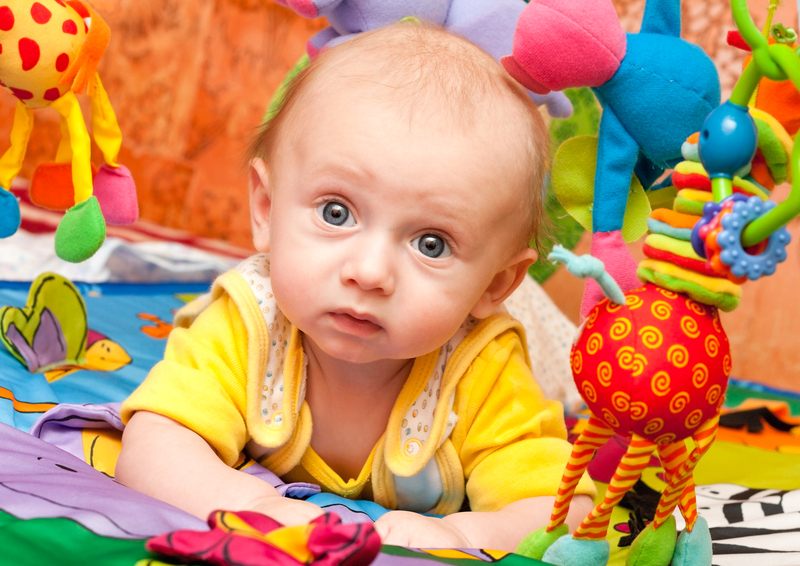 Communication Development Monitoring – checklists for parents of children ages 8-36 months to complete each 6 months to track expressive vocabulary growth as compared to typically developing peers. Checklists can hang on refridgerator as a reminder to families about words appropriate for them to include in daily conversations and so it is handy to mark when a word has been learned. Graphs for boys and girls showing growth via percentile ranks. Scoring examples are also posted to assist in identifying the growth in months for every 6 month period. Auditory Skills Checklists – approximately 85% of children with hearing loss have hearing loss of 70 dB or better. Of the approximately 15% who have 71-110+ dB hearing loss, about half receive cochlear implants. Finally, based on one state’s 2013 data (NC), of the families who chose a communication option, 92% chose spoken language for their children. Only 2% chose ASL and 6% chose simultaneous communication. Fewer than 1% chose Cued Speech. Based on this, it is clear that for the vast majority of children, growth in auditory skill development is very, very important to their future success and should be dligently tracked from infancy. ASL Development for those families and children who use sign language should also be monitored. Information on this website includes an extensive developmental checklist. Pragmatics Checklist – as children transition from early intervention it is critical to determine language performance in all areas. Pragmatics is often overlooked and will not develop at a typical rate, or in the same way for children with hearing loss unless addressed. It is typical for a 7-year-old with hearing loss to have the pragmatics skills of a 3-year-old! Hearing aid use and independence is a concern, even for our youngest children with heairng loss. Families need to develop confidence in monitoring hearing devices and supporting full time use. 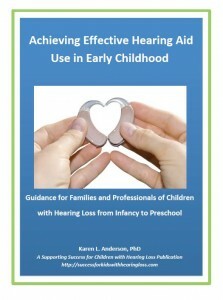 Strategies for Keeping Hearing Aids On and Achieving Effective Hearing Aid Use in Early Childhood are resources to assist in these goals. Monitoring progress is necessary as early language development does not inoculate a child from developing gaps. Research in 2010 studied 87 children with hearing loss of all degrees who had typical cognitive ability and were from English speaking families. All had participated in early intervention. Each child had their language assessed 3-4 times from 48-84 months of age (age 4-7). There were 49 cochlear implant users and 38 hearing aid users. The chart below displays the resulting four categories of performance. 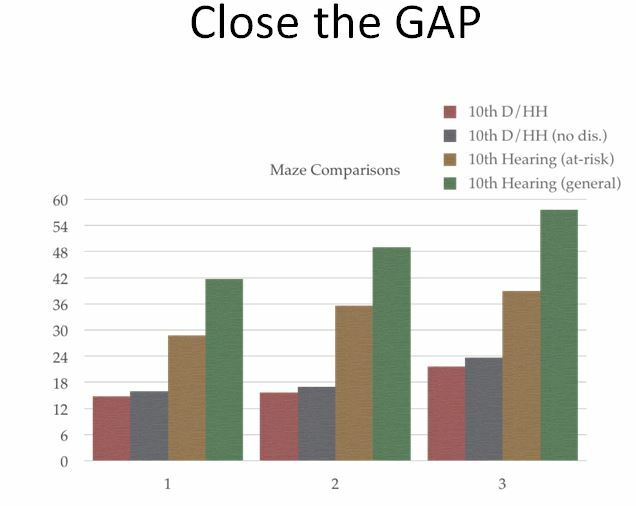 No children born with severe to profound degrees of hearing loss were gap closers. 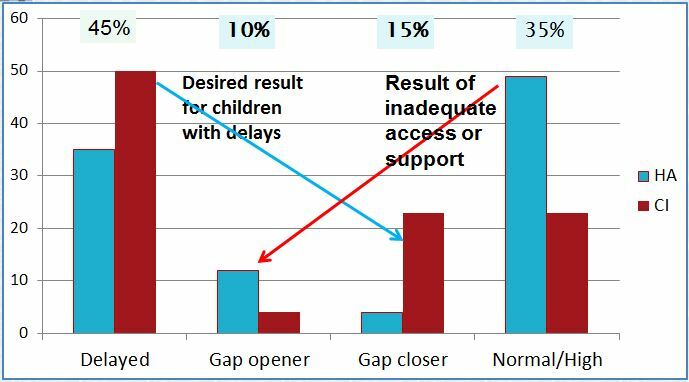 Only 15% of children exiting early intervention at age 3 with language delays will close the gap by age 7. Children with milder degrees of hearing loss were more likely to close the gap, however, children with cochlear implants were more likely to develop typical language by age 7 than were those that wore hearing aids. Unless we monitor school function, including language performance, over time we will be missing developing learning gaps. These gaps are likely due to the result of inadequate access (ineffective communication access) or inadequate levels of support from a specialist in deaf/hard of hearing. Monitoring performance via the MAZE assessment is a common form of curriculum based measurement. MAZE presents sentences or short stories with every 7th word missing. The student must select which of 3 words best fits the missing word in the sentence. Clearly, even our students with hearing loss who do not have IEP services and supports are not performing like their age peers. Chart from here. There is a need for functional assessments to montior students’ academic performance. While curriculum based measures (CBM) have been commonly used in public education for over a decade, it is appropriate to consider CBM use for students who are deaf/hard of hearing specifically. Developed as part of a grant from the US Office of Special Education Programs, AVE:DHH has been designed specifically for students who have hearing loss and/or language differences. Curriculum based measures provide a specific approach to measuring student learning that includes repeated measurement (weekly, monthly) across extended periods of time using general outcome indicators that are sensitive in the rate of change demonstrated in the performance of a task of the same difficulty. AVE;DHH provides individual student data over time in the areas of language, reading and written expression. AVE:DHH is free for use by teachers of the deaf/hard of hearing who are actively working with students. Go to the following website to access AVE:DHH. Listen to the overview for more information and request an account. This grant-funded resource is available at no cost to US educators. Expanded core curriculum refers to those skills that students with hearing loss need to learn to be able to access the general education curriculum and fully participate. Even if a student is provided access to effective communication as required by Title II of the ADA, he or she still needs to learn the skills needed to be able to independently, and confidently navigate successfully as a person with hearing loss in a mainstream setting. These areas will not be taught specifically and yet they must be learned if full participation is expected. Per the Iowa Expanded Core Curriculum guidance, hearing loss adds a dimension to learning that often requires explicit teaching, such as information gained through incidental learning. It has been estimated that for persons without hearing loss, 80% of information learned is acquired incidentally. No effort is required. Any type of hearing loss interrupts this automatic path to gain information. This incidental information must be delivered directly to students who are deaf or hard of hearing. Most teachers without specialized training related to hearing loss do not have the expertise to address the unique needs of students who are deaf or hard of hearing. Therefore, IFSP & IEP team collaboration with educational audiologists and teachers of students who are deaf or hard of hearing is necessary in addressing academic and social instruction and the assessment of these areas.. In order to close this information gap, the Expanded Core Curriculum for Students who are Deaf or Hard of Hearing (ECC-DHH) was developed. Tracking student performance is often done by informal assessment via checklists completed by the student, teacher and/or parents. 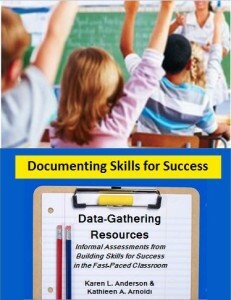 Documenting Skills for Success has more than 57 tools from Building Skills for Success in the Fast-Paced Classroom. There are 10 additional data-gathering tools that included in this e-publication. Of the 67 files, 23 are computer-fillable pdfs. Send a classroom teacher a pdf by email, ask her to complete it and return it to you. Save the results electronically or print out for the student file. E-versions make systematic monitoring easier! 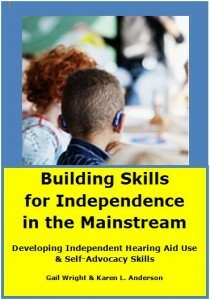 Independence with hearing aids – Has the student made gains on the SEAM? The SEAM – Student Expectations for Advocacy & Monitoring Listening and Hearing Technology is a hierarchy of expected independence skills that was first made available in Building Skills for Success in the Fast-Paced Classroom. 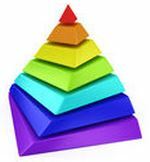 This hierarchy has been expanded into Building Skills for Independence in the Mainstream, which has extensive grade-by-grade expectations for self-advocacy skill development and independence with amplification. This guide provides many teaching materials for students and also discusses how to ‘make the case’ with classroom teachers. It comes with 50 downloadable files. An excellent value for the many, many resources received! Has the student progressed on self-advocacy expectations for his/her grade/age? 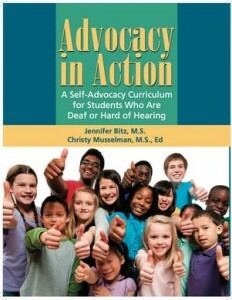 Advocacy in Action also has a Self-Advocacy Skills Assessment Tracker as an Appendix to the many teaching materials and resources included in the guide. Has the student made progress on accuracy following increasingly difficult directions? Following directions requires auditory attention, short-term memory, language of terms used in directions, awareness of when directions don’t make sense (such as mishearing due to the hearing loss). Many students need to hone their skills for listening to and understanding directions. Has the student improved in communication repair skills? Is he more aware of when he misses information? Does he use age-appropriate communication repair strategies? Under what conditions? Just 1:1, in class, socially? 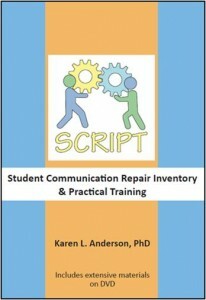 The Student Communication Repair Inventory & Practical Training (SCRIPT) not only provides a means to assess a student’s current level of performance, it is a training curriculum.